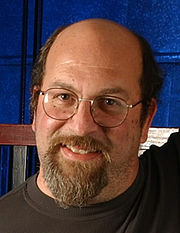 Marc Canter is the son of Chicago activist, David Canter, and the brother of Evan Canter and Anna Pincus of Boca Raton. He is currently CEO of Broadband Mechanics. He lives in Cleveland, Ohio. Canter's company - Broadband Mechanics designs and builds digital lifestyle aggregators (DLAs) for customers like EMI (MyColdPlay), Visual Media (VMFX.net), Ziff-Davis Media (1UP.com), the GoingOn Network, Avid, Cyworld and Tribe.net. After leaving Macromedia in 1992, Canter started Canter Technology which formed the MediaBand (an interactive music video ensemble), produced the Marc Canter Show (and example of scalable content), and implemented a cyber theme restaurant at his home on Potrero Hill in San Francisco. Canter Technology helped Sony build the Metreon Center in SF and several other projects, Fujitsu launch its CD ROM based PC, JVC and NEC with their US strategies and also worked for Intel, HP, Apple and Time-Warner on several key projects. Other clients from that era include On-Command, SGI, nCube and Diva. Canter then went on to build a flat panel system for SuperBowl XXXII (1998), designed a digital city for Trieste, Italy (1998) and an interactive TV authoring system for NOW/com (1999.) Subsequent clients have included Reuters, AOL and the Ealing Digital Studios. Canter is on the board of several startups and sits on many advisory boards as well. July 12, 2000, Ecast, Inc., which delivers content to broadband appliances in public venues, today announced that industry veterans Marc Canter, Tim Bajarin and Terry W. Davis had joined the company's advisory board. The three "will offer strategic guidance and direction to Ecast's management team and leverage their respective expertise to help determine the company's future direction and growth." My father never charged for helping anyone out - and it was only until he was 65 did he ever accept a job from anyone he helped. He was one of those idealistic reds." "My brother worked for Harold in D.C. when he was still a Congressman and got a job as a lawyer prosecuting crooked cops - when Harold came to power. My father remained in the inner circle and helped out on all sorts of political and community activities." On April 6, 1983, the Hyde Park Herald published an endorsement from the Hyde Park/Kenwood Citizens Committee of Democratic Party Chicago mayoral candidate Harold Washington. Signatories to the endorsement included Marc Canter. Ourmedia is a media archive, supported by the Internet Archive, which freely hosts any non-pornographic images, text, and video or audio clips, where this would not violate copyright laws. The website, which launched on March 21, 2005, was founded by Marc Canter and J.D. Lasica. The media archive, Ourmedia, Inc. was incorporated as a nonprofit public benefit corporation in the State of California in September 2005. As of August 2006, Ourmedia had over 110,000 members. Ourmedia is powered by Drupal. This page was last modified on 5 August 2012, at 20:37.